One of ten lessons that demonstrate simple DesignWorks Software techniques and lessons to inspire the use of the DesignWorks tools and help you find your favorite DesignWorks module. BERNINA DesignWorks is a software suite consisting of three modules that can be applied independently of each other. 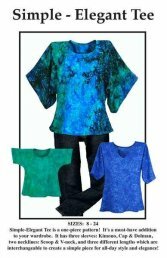 BERNINA DesignWorks supports the personalized creative construction of patterns and forms as well as the editing of completed motifs and designs on your PC. The DesignWorks family includes the modules CutWork, PaintWork, and CrystalWork. This is a webinar class - you will not need to bring a machine. 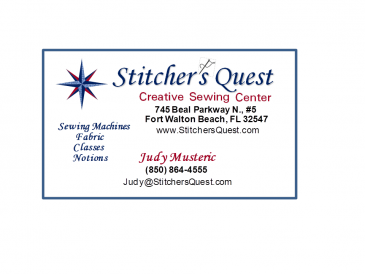 Recommended if you are interested in designing your own embroidery or already have the software. Spring is a time for new plans and projects. 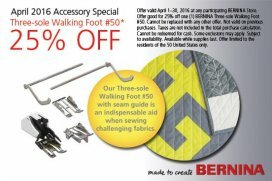 To help those along, we've dropped the prices for all the BERNINA and Bernette demo machines on the sales floor! 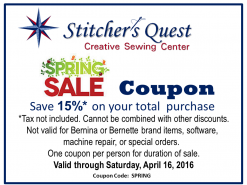 Stop in and find out how affordable a new BERNINA can be. This is a must-have addition to your wardrobe! The Simple - Elegant Tee is a beginner-level garment with three sleeve options: Kimono, Cap, or Dolman. 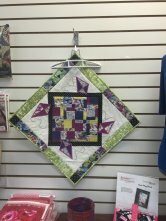 Join us for a fun day to complete this lovely garment. Requirements: Contact shop for supply list.